Are You Looking For Sites Like Amazon Mturk? Here are 5! Published May 16, 2014 By Anna T. This post may contain affiliate links. Regardless, I only recommend sites I've researched and/or used and trust. Amazon Mechanical Turk (mTurk) is one of the most popular short task sites online. It's flexible, there's lots of easy work, you can get paid daily, and signing up is a piece of cake. Most people would agree that you're not going to break the bank doing work on Mturk, but it's one of the best “back-up eggs” online for freelancers — one of those things that's good to have access to when you really need it! 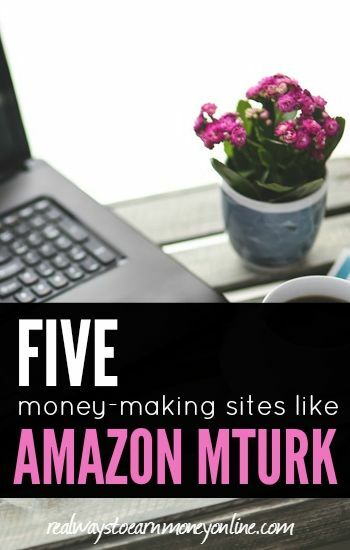 A lot of people who love using Mturk start looking around for sites that are just like it, hoping to have access to even more short task work and make more money. People who are located outside the US may also be in need of an Mturk alternative since it's not possible to get a bank transfer from Mturk if you're not in the US. This is probably the most popular Mturk alternative. I have barely used this site myself, but they've been around for years and I know that they do pay. Microworkers has a lot of different tasks available, some of the most popular being writing reviews, searching keywords, engaging on various sites (liking and commenting) etc. You'll usually find a lot of work posted at Microworkers. They will pay via Paypal, but the people behind the site are in a different country so you will have to wait for them to mail you a PIN number (this can take three weeks or so). Then, once you receive that in the mail and enter it, you should start getting payments regularly. The FAQ says you need at least $9 to request a withdrawal to Paypal or Skrill (Moneybookers). Go here to sign up at Microworkers. This is a “new to me” site. Unlike Microworkers, the people behind this site are based in the United States. However, they allow workers worldwide. To get an idea of the types of jobs they post before actually creating an account, you can check out their Twitter feed here. It looks like they post all their available jobs via Twitter. Before you sign up, you may also want to read what it says under their terms and conditions about inactive accounts and chargebacks. Go here to read more about working for ClickChores. This short task site is pretty popular in the work from home circles and they are open worldwide. Tasks available include everything from simple research to tagging. Their UHRS tasks are extremely popular amongst their workers. Payments are made either via Paypal or bank transfer. Paypal payments are weekly and bank transfers happen once per month. The Clickworker website claims most of their workers earn on average $9 to $10 hourly, but since this is task-based work, your actual rate of pay will depend on how fast you can go and whether or not you can find tasks available to do. Go here to sign up at Clickworker or read the Clickworker review. This is another very reputable company you can do short task work for, and they appear to be open worldwide. While this company used to post most of their tasks directly on mTurk, they've since launched their own platform you can work from. This is so they can pay workers directly with Paypal — something that can't be done with Mturk. OneSpace has everything from photo tagging to writing/editing work available. I got an invite to their workstation but have not done any work there. In order to get access to their platform, you'll have to get an invite from them. Go here to sign up at OneSpace or read the OneSpace review first. Crowdflower (open worldwide) used to post most of their tasks on Mturk, but nowadays you will find them on various rewards sites like Inbox Dollars, Swagbucks, etc. These are Crowdflower's channel partners and for the most part, work and pay are done through some of these platforms. Keep in mind that all of these sites pay out differently and work differently. This may not be the most lucrative way to get paid for short tasks since these sites are not known for paying much, but it's one option available to you if you are interested in doing short task work apart from Mturk. This company has all kinds of tasks — surveys, categorization, search engine evaluation, and so on. The pay per task varies widely and changes frequently. Go here to learn more about doing short task work for Crowdflower. I also want to point out that pretty much anyone can post a job on these sites. Because of that, be super careful about which tasks you accept! If something sounds unethical, scammy, or you think it may lead to you getting a lot of spam, you should probably pass. I was laid off a few months ago and I’ve been posting graphic design work on a few of the sites you have listed along with a few others you don’t have listed. It has been a really good income stream for me. I didn’t see any of these jobs listed, you should consider checking out. Marcie, I know this is an older post, so you may not see this; thank you for the tip on Damongo. I took a quick peek and it seems similar to Fiverr? I’ll check it out; but if you and Anna don’t mind my asking here, would you mind sharing some other ways you make money with graphic art work? I must really thank you for you genuine information. I am from India. Working with mturk since 2011 and have no problems at all. Crowd Source seems good as they post their works on Mturk too. They pay in time. Post good alerts to earn from home it will be helpful some unemployed worldwide. Most of the things you’ve been doing are just good for extra money, so it would be hard to really turn any of those into an actual job and make minimum wage. They are good to do here and there because it’s mostly easy stuff and the money will build up over time, but not to rely on for steady income or to consider your job. If you want to make minimum wage, you may want to consider other types of work like freelance writing, transcription, or maybe some phone work from home. Those are all industries where it’s possible to get started without experience. I have a lot of articles posted on this website with information for people who are trying to get started in some of those industries. And if you haven’t yet, be sure to browse this page Monday-Friday – https://realwaystoearnmoneyonline.com/work-at-home-job-leads . These are my weekly job leads and the vast majority of things posted there are actual jobs, not extra money opps. Thats’s weird, I have been using Microworkers for a month and already have $30 sitting in my paypal from it. They send payments that never make it to paypal and you cannot get any customer service or response from them at ALL……I would avoid doing business with them if I were you , they have owed me money for two years now. I use mturk as an egg myself, not even backup. I know some people claim that you can only make pennies from them but I think it is all about finding the right niche. Once you figure out the jobs that you can do quickly and that pay well you can definitely make a few hundred extra dollars a month. This won’t pay all the bills but it will definitely cover one or two! Side note: I really have to thank you for all the work you put into this blog. I’ve been reading here for quite awhile and I currently work for two companies that I found through you and am in the interview process with a couple more. I may have found them without this blog but it sure would have been a much harder road. Thank you so much! Thank you! I appreciate the kind words! I would like to know about the sites that do direct deposit to your banking account. Do you have any that I can take a look at? Mturk does … I think that may be the only one from this list that pays that way. I think Microworkers might do it, but not sure if that’s for people in the US, outside the US, or both. I signed up for MTurk two years ago and I still have no regrets about it. In the past year or so, I find that if I complete more surveys, I make a little more pocket change than if I just do the other stuff like matching keywords to URLs or finding the search ranking of a URL (which I haven’t seen in a long time). Jenine, I agree that Mturk has come a long way in offering legit hits to do and pay per hit has gotten a lot better too. I too make more than just pocket change with it and I find myself turning to this opportunity more than I use to as well. So all of the information on your website is scam free. I have been looking for work at home jobs. How often do you post. Also, what is the normal requirements for look for work jobs? Carla, This is really one of the best sites for looking for work from opportunities that I have come across. There are many sites but it takes a lot of patience not to get taken in by the scams. While Anna does warn us about this she does an excellent job of finding the legit jobs and writing reviews for many of them. Spend some time looking around and if you have questions just ask. 🙂 I wish you all the best in finding work.